On 20 January a felt earthquake occurred at Tandikat, which was followed by a significant number of volcanic earthquakes. This led VSI to raise the Alert Level to 2 (on a scale of 1-4) on 25 January. Volcanic seismicity at Tandikat increased significantly following a felt event (MM III) on 20 January 2002 (table 1). Deep-volcanic earthquakes totaled 149 during the week of 20-26 January, a period when 174 tectonic events were also recorded. Both types of earthquakes decreased significantly the next week, and gradually declined further over the following two weeks. The weekly report for 27 January-2 February noted that visual observations were not possible due to thick fog. The hazard status was set at Alert Level 2 (on a scale of 1-4) on 25 January 2002 and remained at that level through 16 February. Seismic activity at Tandikat increased significantly over the week of 20-26 January 2003. One felt earthquake (III on the MMI scale) on 20 January was followed by a significant number of deep volcanic earthquakes. The number of both volcanic and tectonic earthquakes resulted in the volcano's hazard status being upgraded to Alert Level 2 on 25 January. Seismic activity decreased over the period 27 January-16 February (table 1), but remained at an elevated level. Table 1. Seismicity recorded at Tandikat, 13 January-16 February 2003. Data courtesy of VSI. Tandikat and its twin volcano to the NNE, Singgalang, lie across the Bukittinggi plain from Marapi volcano. Volcanic activity has migrated to the SSW from the higher Singgalang, and only Tandikat has had historical activity. The summit of Tandikat has a partially eroded 1.2-km-wide crater containing a large central cone capped by a 360-m-wide crater with a small crater lake. The only three reported historical eruptions, in the late 19th and early 20th centuries, produced only mild explosive activity. Kastowo, Leo G W, 1973. Geologic map of the Padang quadrangle, Sumatra. Geol Surv Indonesia, 1:250,000 scale. There is no Deformation History data available for Tandikat-Singgalang. There is no Emissions History data available for Tandikat-Singgalang. The historically active Gunung Tandikat lies across the Bukittinggi plain from Marapi volcano in central Sumatra. 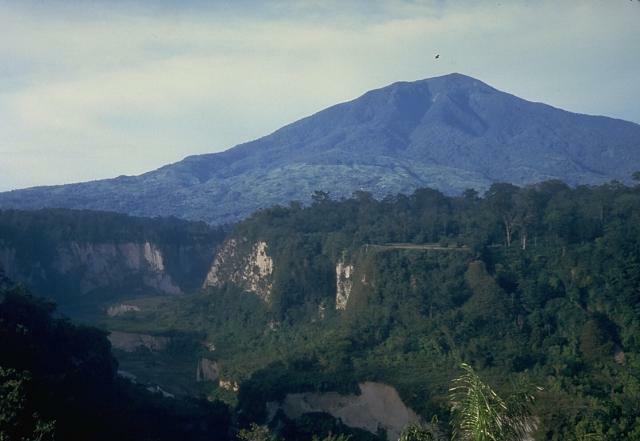 The summit of Tandikat's twin volcano, Singgalang, is seen here from Bukittinggi city across the steep-walled Ngarai canyon north of the volcano. Gunung Tandikat contains a central cone and a small crater lake constructed within a larger 1.2-km-wide crater. Three small explosive eruptions, the last in 1924, have occurred in historical time. Gunung Tandikat, rising above Kandang village on its southern flank, forms a twin volcano with Gunung Singgalang. The two volcanoes were constructed along a NNE-SSW line across from Marapi volcano. The summit cone, containing a 340-m-wide crater, was constructed within a larger 1.2-km-wide crater whose western rim forms the sharp peak below the summit. 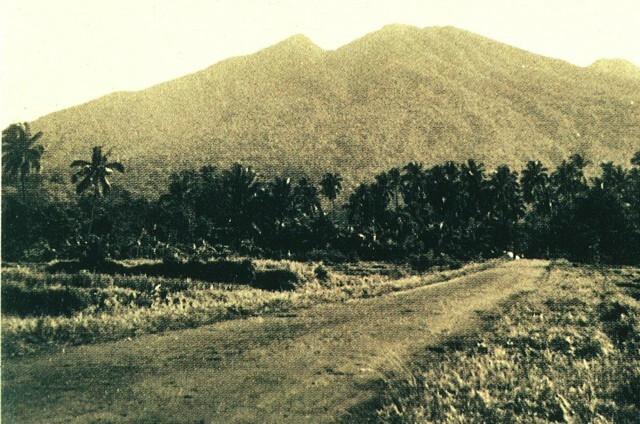 Photo by Sumarma Hamidi, 1970 (Volcanological Survey of Indonesia). There are no samples for Tandikat-Singgalang in the Smithsonian's NMNH Department of Mineral Sciences Rock and Ore collection. IRIS seismic stations/networks Incorporated Research Institutions for Seismology (IRIS) Data Services map showing the location of seismic stations from all available networks (permanent or temporary) within a radius of 0.18° (about 20 km at mid-latitudes) from the given location of Tandikat-Singgalang. Users can customize a variety of filters and options in the left panel. Note that if there are no stations are known the map will default to show the entire world with a "No data matched request" error notice. Large Eruptions of Tandikat-Singgalang Information about large Quaternary eruptions (VEI >= 4) is cataloged in the Large Magnitude Explosive Volcanic Eruptions (LaMEVE) database of the Volcano Global Risk Identification and Analysis Project (VOGRIPA).